Well-known for being great travellers and intrepid adventurers, the Canarians are aware that the mixture holds the secret for a unique product. After manufacturing tobacco for three hundred years, the islanders have mastered the art of selecting the most adequate raw materials. And this skill is, precisely, the one which has positioned the cigars from the Canary Islands amongst the best of the world. As we define in our glossary, a blend is the mixture of different types of tobacco in a cigar. It is also the formula of its composition, obtained according to the specifications defined by the mix of the different leaves, the variety of plant used, foliage layer or geographic origin. The personality of the cigar depends on this blend and it can include tobaccos from several countries, harvests and years. The main objective of the master blender is to produce an enjoyable and unique blend. More than half of the raw materials used in the crafty process of manufacturing Canarian cigars is the result of a careful selection of the best tobaccos of the Dominican Republic, Honduras, Nicaragua or Brazil. Unlike the Cubans, who are only allowed to use tobacco from their country to elaborate cigars, the Canarians nourish from different blends which result in a singular and balanced product in terms of textures, flavours and aromas. All these qualities materialise in KOLUMBUS, as the filler of our cigars is composed by leaves from the quintessential tobacco from La Palma, the Breña variety, and is completed with other medleys like Connecticut, Ecuador-Havana o Nicaragua. 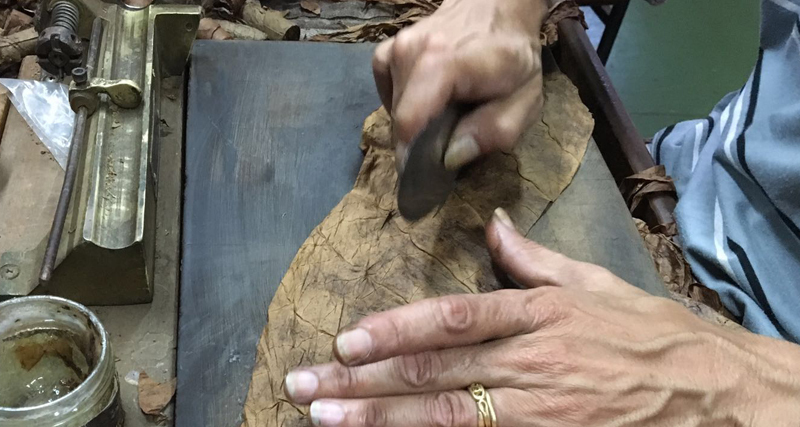 Thus, it is worth stressing that the use of tobaccos from different origins does not depreciate the final quality of the cigar but on the contrary; the Canarians have developed a great skill balancing the best qualities of each of the tobaccos touched by their expert and diligent hands. Thanks to a great tradition and the shared secrets which pass on from generation to generation, the blender of the Canary Islands has become a master admired around the world. Hence, the Canarian cigar is closely linked to the idea of tobacco blend.